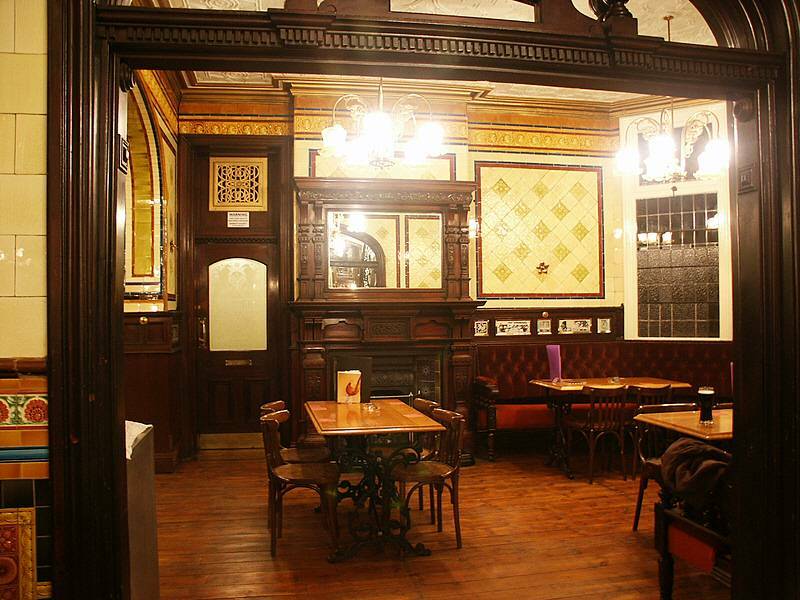 This Grade II* pub has only reopened in February 2003. It used to belong to a pub group but was shut for two years after they couldn't make a go of it. Not exactly situated in the most salubrious part of town, it is a short bus ride out from the city centre (51, 52, 33, 34, get off at Aston Baths). 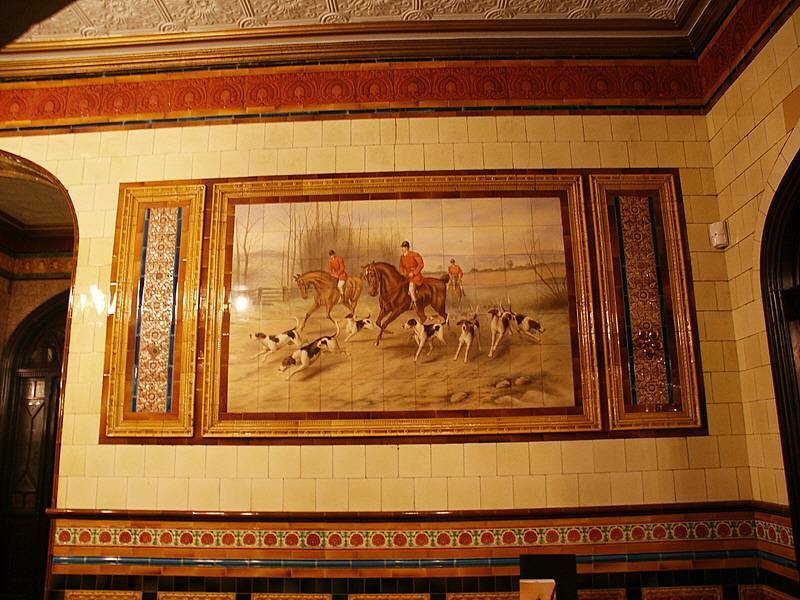 Bought up by Oakham Ales of Peterborough when the managing director fell in love with it, this 19th century built pub has retained many of its splendours and attractions for the drinker and lover of seriously good tile work. There are two bars here, though only one is a serious place to get served. 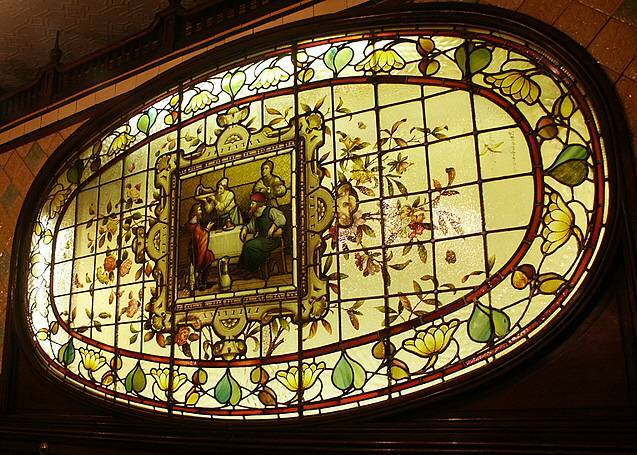 At the moment only the 'public' bar entrance is open with ornate glass work in the doors. I say 'public' because it has been brought out by Oakham to the original splendour with tiled floors and dark furniture around the island bar in a horse shoe shape. The bar itself is high, so not easy for the disabled to be served here. There is an overhang as well so the visual space is limited. Hand pumps are dotted along the bar in groups and so you need to walk round the entire bar, including the back bar to find out what is on - I smell a beer festival at some stage with all these hand pumps. The walls here are plainer than the rest of the pub, but still good to look at. To enter the rear of the pub - where the toilets, etc are - you have to go up steps (there is a middle entrance which might allow disabled access, but it was locked on this occasion. You might have to have an able-bodied person with you to ask them to open the doors). Once up the steps the visual delights keep coming. 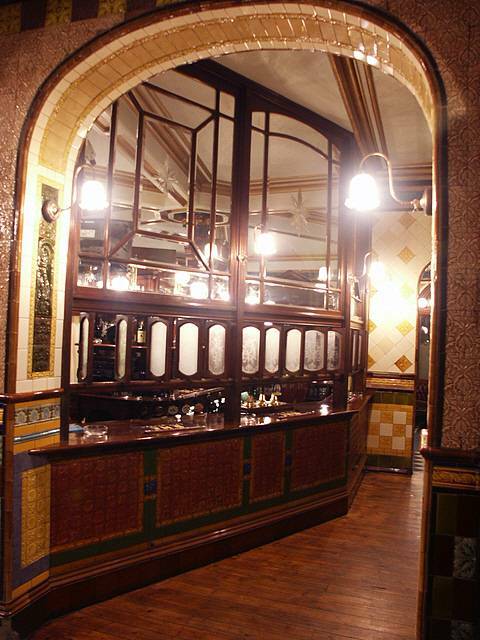 Almost every available surface is covered with the original turn of the century tiles - no corporate vandalism here. 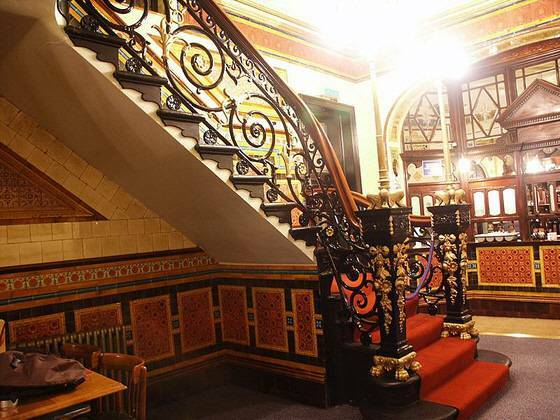 Pillars, walls, archways, are all covered with tiles only the Victorians could produce. There is a glorious hunting frieze opposite the underneath of the ornate ironwork staircase - you are not allowed up it, unless for a designated meeting - and the stained glass oval 'window' in the smoke room has an old master in the centre. There are two main rooms here, the smoke room - a long hall like room with tiles, of course, and the stained glass, plus it has a working fireplace in winter. Oblong tables are set round the edge (except for one round table in the centre) which has a long velour bench against the wall and chairs for seating - no stools here. there is also one church pew underneath the stained glass 'window'. The height of the ceiling gives an immense feeling of space and tranquillity and you can hardly hear the A34 outside. The other room shares the high ceiling, tile work and the original wooden floorboards. It too has a working fireplace and bench seating with additional chairs. There is a bar area up here - part of the island mentioned earlier - but it was built in a time when people had shorter stature and consists of snob screens at an oblique angle. You have to bend down to peer through at the bar, which can make it difficult to get served, though there is a bell to press for service. As this is an Oakham house it will always have at least four of it's own real ales on (a welcome addition to the Birmingham scene which has always been a Bank's stronghold), plus two guest ales - Dent Weather or Not and Dark Star Hophead in the opening week. All were superbly served, cool but not cold. No sparklers here, but you might find a top up request in order - Brummies like heads normally. Food is served 12-2.30 and 5.30-10pm (Sun 12-2.30, 5.30-9.30). All the food is Thai, cooked by three, yes, three chefs trained by a Thai cook. The selection is large with vegetarian options of most dishes possible. The variety of styles and sauces is wide and the prices do not break the bank. Lunch ranges through �3.25 - �4.75, salads up to �6 and main meals with which you have to buy rice or noodles up to �7.95. No accommodation here. The accommodation listed is not the closest, but it's the Wetherspoon in town. The Bartons is a great pub made great once more by Oakham. It is well worth the effort to get to it from town and you wont be disappointed. I've made it my new local.